A regular breeding resident and migrant; also regular during the winter months in southern Minnesota. The Double-crested Cormorant was a common species during the Minnesota Breeding Bird Atlas (MNBBA). The Double-crested Cormorant can be found along both coastlines during the breeding season as well as at inland breeding sites in the central Canadian provinces and the north-central region of the United States, from Montana east through the Great Lakes. The core of its breeding population is centered in the northern Great Plains, including southern Minnesota (Figure 1). Assigned a Continental Concern Score of 8/20 by Partners in Flight and considered a species not currently at risk by the North American Waterbird Conservation Plan. Although some birds are seen year-round in Minnesota, most cormorants that breed in Minnesota are medium-distance migrants, wintering along the southern Atlantic Coast, the Gulf Coast, and on inland lakes and reservoirs in the southeastern United States. Almost entirely small fish, obtained by diving and pursuing prey underwater. The species’ fish-based diet is the source of considerable friction among commercial fishermen and recreational anglers. Uses a variety of materials to construct an open platform that may be placed on the ground, in trees or shrubs, or on mats of emergent wetland vegetation. A colonial nesting species. Breeding distribution and relative abundance of the Double-crested Cormorant in North America based on the federal Breeding Bird Survey, 2011–2015 (Sauer et al. 2017). Except when the water is frozen firmly, there is no time in the year when they may not be seen in almost every general section where the conditions are favorable to their habits of feeding. The flight was so large that at times it was impossible to see the sunset sky through the mass …The number of birds is variously estimated … from 100,000 to 1,000,000 birds. Widely perceived as a “menace” to local fish populations, the Double-crested Cormorant was routinely molested and shot at in its nighttime roosts during migration and in its nesting colonies during the breeding season. Permits to shoot the species were issued by the Minnesota Game and Fish Commission, primarily during spring migration. Given the species’ quick demise, it is likely that many citizens simply took action into their own hands. Numbers had declined so precipitously by 1930 that Roberts’s account only documented three active nesting colonies in the state: Gull Rock in Lake of the Woods, Crane Island in Lake Minnetonka, and Kawishiwi Lake in Lake County. Together the three sites supported less than a few hundred birds. Several large, well-known nesting colonies had been abandoned, including three sites on lakes in southwestern Minnesota: Heron Lake (Jackson County), Loon Lake (Jackson County), and Lake Shetek (Murray County). Information on the wholesale slaughter of this species on its rookeries and elsewhere in Minnesota during 1948 by organized groups and shooting parties has reached the editor’s desk. Is this killing justifiable? Or are these people misinformed as to the true relationships of this species to fish and the fishing industries? Or is this unprotected bird being shot largely in the name of “sport” at times when the game seasons are closed? Warner ended his note with a call for more information about the species’ status. Observers throughout the state soon responded with reports of small colonies at widely scattered locations, including Rice Lake National Wildlife Refuge in Aitkin County (Hofslund 1950), Gull Rock in Lake of the Woods (Dobie 1956), and Shields Lake in Rice County (Hanlon 1956). Although the carnage continued and the species was not federally protected until 1972, populations in Minnesota and throughout North America were slowly rebounding. Unfortunately, the new threat on the horizon in the 1950s was the widespread use of pesticides, which took its toll on many fish-eating species, including the Double-crested Cormorant. Contaminant levels were so high in the Great Lakes fish populations that they likely led to the cormorant’s extirpation on Lake Superior and Lake Michigan. But as contaminant levels gradually declined in the 1970s, this adaptable species once again bounced back. Populations not only stabilized, they began a slow and steady growth in numbers in the 1980s and early 1990s, followed by a period of rapid growth beginning in the late 1990s (Dorr et al. 2014; Sauer et al. 2017). Just as populations were beginning to recover, the Minnesota Department of Natural Resources’ newly established Nongame Wildlife Program began to examine the status of all colonial waterbirds in the state. The program solicited reports from field staff working across the state and from other resource agencies, colleges, universities, and published accounts. Based on this information, program staff issued a series of five reports that tracked the distribution and abundance of all colonial-nesting species from the mid-1970s through 1985 (Henderson 1977, 1978, 1984; Henderson and Hirsch 1980; Guertin and Pfannmuller 1985). These reports depicted the rapidly changing status of the Double-crested Cormorant. In 1977, 12 active colonies were identified in 8 counties: most colonies were located in central Minnesota and in the northwestern corner of the state. Just eight years later, 26 colonies were identified in 18 counties, including 7 colonies in Lake of the Woods. One of the latter sites, appropriately known as Crowduck Island, supported the state’s largest nesting colony, numbering 1,024 breeding pairs (Guertin and Pfannmuller 1985). During this period, both Green and Janssen (1975) and Janssen (1987) described the species as a statewide resident, common in all but the northeastern and north-central regions. By 1998, Hertzel and Janssen would delineate confirmed nesting records in 28 Minnesota counties since 1970. When a statewide census was conducted in 2015, the Double-crested Cormorant was documented nesting at 36 sites distributed across 20 counties, stretching from Faribault County in south-central Minnesota north to Lake of the Woods, Itasca, St. Louis, and Lake Counties (Hamilton and Cuthbert 2016). During the MNBBA, participants reported 1,165 Double-crested Cormorant breeding records from 12.7% (606/4,762) of the surveyed atlas blocks and from 13.5% (316/2,337) of the priority blocks. Breeding evidence was gathered in 57 atlas blocks (Figures 2 and 3; Table 1). The species was observed in 77 of Minnesota’s 87 counties and was confirmed breeding in 30 counties; the atlas block for the nesting colony located on Pig’s Eye Lake straddled 3 counties (Ramsey, Dakota, and Washington). MNBBA surveyors originally reported over 400 “possible” breeding records and a handful of “probable” records for the Double-crested Cormorant. In the course of reviewing all MNBBA data, these records were changed to “observed.” Although the Double-crested Cormorant frequently feeds near its nesting colony (less than 10 km), some birds may travel up to 62 km to good foraging sites (Dorr et al. 2014). As a result, unless the birds are on or near the nest, observations away from the nesting colony cannot be assumed to indicate possible or probable breeding status where they are observed. What Minnesotans have learned in the past 100 years, humanity has known for millennia: the Double-crested Cormorant is an extraordinary and very adaptable species (Wires 2014). The species has made a remarkable recovery from near decimation in the early 1900s, not only in Minnesota but throughout the Great Lakes and North America (Sauer et al. 2017). Given some of the reports of its abundance in the early 1900s, particularly during migration, it certainly has not recovered to its former level of abundance. In the face of increased calls for controlling local populations in the past decade, the challenge for wildlife managers is to sustain healthy populations while still addressing conflicts between burgeoning cormorant populations and concerns by local citizens about the species’ impact on local fisheries. Breeding distribution of the Double-crested Cormorant in Minnesota based on the Breeding Bird Atlas (2009 – 2013). Summary statistics of observations by breeding status category for the Double-crested Cormorant in Minnesota based on all blocks (each 5 km x 5 km) surveyed during the Breeding Bird Atlas (2009-2013). Summary statistics for the Double-crested Cormorant observations by breeding status category for all blocks and priority blocks (each 5 km x 5 km) surveyed during the Minnesota Breeding Bird Atlas (2009-2013). A colonial species, the Double-crested Cormorant selects a variety of sites for nesting, including islands within lakes, rivers, and reservoirs; coastlines; emergent wetlands; woodlands; snags along flooded shorelines; and artificial structures, such as towers and bridges (Figure 4) (Wires et al. 2010; Dorr et al. 2014). Sites that are free from mammalian predators and human disturbance yet close to open waters with abundant fish populations are most suitable. The Double-crested Cormorant is both a tree and a ground nester; in colonies where many of the original nesting trees have died, the species often remains at the site but begins nesting on the ground. On the ground, nesting substrates vary from large boulders and small, rocky islets to broad, flat beaches of bedrock, sand, or gravel. Occasionally, the species nests on mats of emergent vegetation in expansive wetlands (Anderson and Ellis 1966). The Double-crested Cormorant also demonstrates flexibility in its nesting partners. Although it does nest in single-species colonies, it frequently co-nests with other colonial-nesting waterbirds. Ground-nesting colonies are often shared with the American White Pelican, the Common Tern, and/or the Ring-billed Gull; tree-nesting colonies are often shared with the Great Blue Heron, the Great Egret, and/or the Black-crowned Night-Heron. Typical breeding habitat of the Double-crested Cormorant in Minnesota (© Lee A. Pfannmuller). In 2002, the North American Waterbird Conservation Plan estimated the North American population of Double-crested Cormorants as greater than 740,000 breeding adults (Kushlan et al. 2002). In the nearly two decades since that estimate was published, cormorant populations have continued to increase. 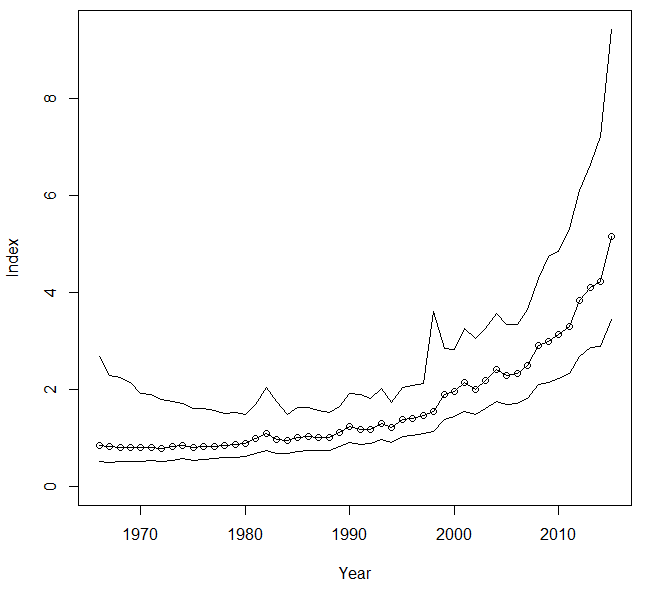 Although it is not a particularly robust monitoring tool for colonial waterbirds, the federal Breeding Bird Survey (BBS) has shown a statistically significant average increase of 3.76% per year from 1966 to 2015 throughout the species’ breeding range, increasing to 8.48% per year since 2005 (Figure 5). The increase has been equally dramatic in Minnesota, where populations also showed a statistically significant increase of 6.14% per year since 1966 and 5.97% per year since 2005 (Sauer et al. 2017). Despite this remarkable increase, the Double-crested Cormorant’s relative abundance on BBS routes in the state is still low, so the trend lacks statistical precision. There is no doubt, however, of the species’ dramatic increase. Population estimates generated over the years certainly support the rapid population recovery in Minnesota. Roberts’s (1932) account documented 3 nesting colonies, totaling fewer than 248 adults or 124 breeding pairs. Forty-six years later, Henderson (1978) documented a total of 11 nesting colonies in the state. Nest counts at 6 of the sites totaled 1,175 nests or breeding pairs, leading Henderson to speculate that the total statewide population might be approximately 1,500 breeding pairs. Six years later, in 1984, 26 colonies had been documented and the statewide population was estimated at 5,100 nesting pairs (Henderson 1984). Beginning in 2004, the Minnesota Department of Natural Resources initiated a periodic census of all Double-crested Cormorant and American White Pelican colonies in the state. Several emerging issues prompted the census; principal among them was the local population control that began in 2005 in response to concerns that growing numbers were impacting local fisheries. Periodic monitoring efforts would help state biologists assess how these control efforts were affecting the statewide cormorant population. Because the pelican, a Special Concern Species in Minnesota, frequently nests in association with cormorants, it was equally important to ensure that cormorant control activities were not impacting co-nesting species. The census is conducted every five years, and the results from three of these surveys are now available (Wires et al. 2006, 2011; Hamilton and Cuthbert 2016) and are displayed, along with estimates dating back to 1932, in Figure 6. Although colonies can move considerably from year to year, the population has remained relatively stable from 2004 to 2015 at approximately 15,500–16,000 breeding pairs nesting at 36–42 different colony sites. These estimates do not include nonbreeding cormorants that may be present at breeding colonies for a year or two until they initiate nesting. One of the surveys was conducted during the MNBBA and aided immeasurably in the compiled atlas results. The factors responsible for the species’ original declines were noted earlier: principally persecution, followed by high contaminant levels. Since the species has been protected and contaminant levels have declined, populations have been quick to recover. 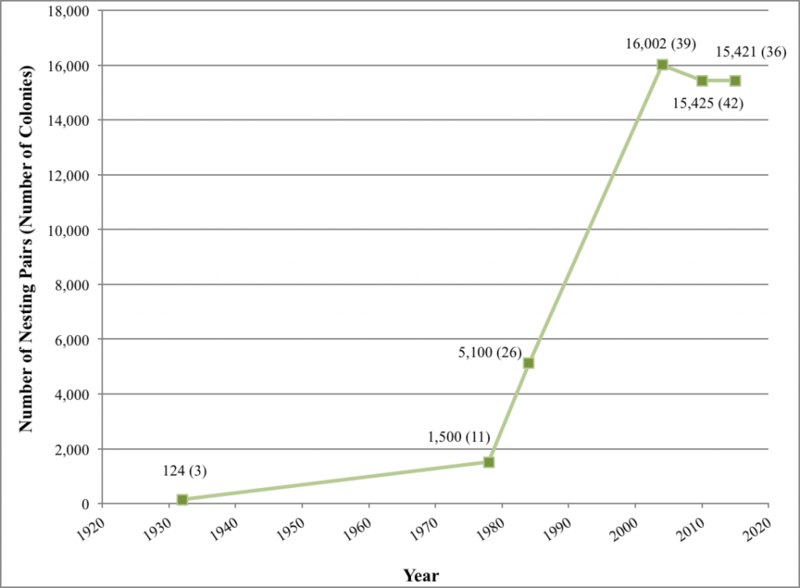 Breeding population trend for the Double-crested Cormorant in North America for 1966–2015 based on the federal Breeding Bird Survey (Sauer et al. 2017). Double-crested Cormorant population numbers in Minnesota (number of nesting pairs and number of colonies; Roberts 1932; Henderson 1978, 1984; Hamilton and Cuthbert 2016). Due to its wide distribution and growing population, the Double-crested Cormorant has been assigned a relatively low Continental Concern Score of 8/20 (Partners in Flight 2017). The North American Waterbird Conservation Plan considered it to be a species not currently at risk (Kushlan et al. 2002). Indeed, its very success at recovery has once again led to growing public concerns and resource conflicts. Among the principal issues raised are concerns that cormorant populations are impacting local fish populations, decimating fisheries’ stocks at aquaculture facilities and natural ponds managed for bait fish production, negatively impacting vegetation at nesting colonies, and serving as a vector for diseases such as West Nile virus and Newcastle disease (Minnesota Department of Natural Resources 2016). At least one study in North Dakota documented the spread of Newcastle disease from cormorants to domestic turkeys (Heckert et al. 1996). In lieu of similar issues being raised across the Double-crested Cormorant’s breeding and winter range, the U.S. Fish and Wildlife Service has established a series of regulatory tools that enable private and public entities to address damage caused by the bird. The first tool is a depredation permit that enables private landowners to use a variety of options to alleviate damage to their property caused by cormorants. Between 1999 and 2012, an average of 529 cormorants was taken each year in Minnesota under authorized depredation permits. The average was only 22.2 birds per year from 1999 to 2007; the number rose significantly from 2008 to 2012, when an average of 1,440 birds was taken per year (Table 2) (U.S. Fish and Wildlife Service 2014). These permits are issued to address damage caused by a variety of species that are federally protected. The second tool is a permit authorized under the federal Aquaculture Depredation order that allows private, state, and federal fish-hatchery owners to kill cormorants that are “committing or about to commit depredations to aquaculture stocks.” The Aquaculture Depredation order was established in 1998 and updated in 2003; since 2003, an average of 1,713 birds are taken each year in Minnesota under the order (Table 2) (U.S. Fish and Wildlife Service 2014). Finally, take is also authorized under the Public Resource Depredation order. Established in 2003, the order authorizes federally recognized tribes, the U.S. Department of Agriculture’s Wildlife Services office, and state resource agencies “to reduce the occurrence and/or minimize the risk of, adverse impacts of cormorants to public resources.” Numerous requirements must be met before actions can be taken using the authorities granted by this order. In Minnesota, the Public Resource Depredation order has been used to control the Double-crested Cormorant on lakes where public fisheries are considered at risk, most notably on Leech Lake. Between 2005 and 2012, a total of 19,694 cormorants were taken under this authority; the vast majority taken at Leech Lake (Table 2) (U.S. Fish and Wildlife Service 2014). At present, the monitoring of statewide cormorant populations shows that the species’ population has stabilized and the period of exponential growth is over. Significant culling operations underway in Minnesota and elsewhere in the species’ range have likely contributed to the leveling off of population numbers. More than half a million birds (506,319) have been taken across the species’ range since 1999 under the legal authorities mentioned above (U.S. Fish and Wildlife Service 2014). Many citizens perceive that the Double-crested Cormorant has reached an unacceptable level of abundance. A review of historical records, however, suggests that prior to the 1900s, the Double-crested Cormorant was present in numbers far greater than those observed today, even with the significant increase witnessed in the past 40 years (Wires and Cuthbert 2006). Some of the early accounts from Minnesota corroborate that conclusion. Although many ecological factors have impacted and will continue to impact the distribution and abundance of the Double-crested Cormorant, from environmental contaminants to disturbance to climate change (Dorr et al. 2014; Langham et al. 2015), one of the most significant has been and may continue to be conflicts with humans over fishery resources. Primarily a fish-eating species, the Double-crested Cormorant is an opportunistic feeder, consuming fish based on their availability. Most fish consumed are small, less than 15 cm in length (Dorr et al. 2014). Countless studies have examined the species’ feeding habits and the wide variety of prey consumed; many studies have a particular focus on the consumption of species prized by recreational anglers, such as walleye. Losses due to cormorant predation are clear and well documented at confined aquaculture facilities, including facilities in Minnesota (Wires and Cuthbert 2003). The species’ impacts on natural fish populations, however, are less clear. A complex array of factors can affect local fisheries in a given year, and teasing out the contribution of one single factor, such as cormorant predation, at the exclusion of all others is extremely difficult. In Minnesota, an intensive study of the fish population in Leech Lake, where one of the largest cormorant colonies resides, concluded that “predation pressure by the expanding cormorant population could have been sufficient to impact walleye survival to older age classes” (Minnesota Department of Natural Resources 2016). An intensive effort to reduce the cormorant population on the lake and maintain it at a level of 500 breeding pairs was initiated in 2005, after extensive review and public input. Unfortunately, the public is often quick to ascribe poor fishing success to the local presence of cormorants. As a result, management operations not only have taken place at Leech Lake but, using the authority granted by the Public Resource Depredation order also at Potato Island on Lake Vermillion. Efforts to discourage nesting were also attempted for a season at Knife Island on Lake Superior. Control efforts were undertaken at Lake Waconia in Carver County and Wells Lake in Rice County under the authority of the depredation permits for animal damage on private property (Hamilton and Cuthbert 2016). In 2014, the U.S. Fish and Wildlife Service moved to extend the effective date of the two depredation orders for 5 years, through June of 2019. In response to this proposed extension, a lawsuit was filed by the Public Employees for Environmental Responsibility, arguing that the U.S. Fish and Wildlife Service had failed to examine the long-term consequences of cormorant control. Upon hearing the case, a U.S. District Court then vacated, or rendered the Aquaculture Depredation Order and the Public Resource Depredation Order null and void until the U.S. Fish and Wildlife Service can take measures to ensure that they are in full compliance with the National Environmental Policy Act. As of late 2017, further action by the service is still pending. Although managing fish-eating birds to benefit fishery yields may increase some fish populations, this approach does not resolve or address the underlying problems causing current fish population declines across the continent. Hopefully, a more informed and conservation-conscience citizenry in the twenty-first century will ensure that control efforts are only undertaken when absolutely necessary and that the Double-crested Cormorant, like all fish-eating birds from loons to grebes to pelicans, will always continue to have a proper place in healthy ecosystems. Take of Double-crested Cormorants in Minnesota with different regulatory tools (Source: U.S. Fish and Wildlife Service 2014). Anderson, Daniel W., and John W. Ellis. 1966. “Cormorant Nesting in Northwestern Minnesota.” Loon 38: 5–8. Dobie, John. 1956. “Cormorants at Lake of the Woods.” Flicker 28: 108–109. Grassett, Frank. 1926. “An Unusual Flight of Cormorants.” Wilson Bulletin 38: 234–235. Heckert, Robert A., Michael S. Collins, Ruth J. Manvell, Ian Strong, James E. Pearson, and Dennis J. Alexander. 1996. “Comparison of Newcastle Disease Virus Isolated from Cormorants in Canada and the USA in 1975, 1990 and 1992.” Canadian Journal of Veterinary Research 60: 50–54. U.S. Fish and Wildlife Service. 2014. Final Environmental Assessment: Management of Double-crested Cormorants under 50 CFR 21.47 and 21.48. Warner, Dwain W. 1948. “Destruction of Double-crested Cormorants.” Flicker 20: 99. Wires, Linda R. 2014. The Double-crested Cormorant: Plight of a Feathered Pariah. New Haven, CT: Yale University Press. Wires, Linda R., and Francesca J. Cuthbert. 2003. Fish-eating Bird Predation at Aquaculture Facilities in Minnesota: A First Step Towards Bridging the Information Gap. Final report to Minnesota Sea Grant. Wires, Linda R., and Francesca J. Cuthbert. 2006. “Historic Populations of the Double-crested Cormorant (Phalacrocorax auritus): Implications for Conservation and Management in the 21st Century.” Waterbirds 29: 9–37.